SUPAFLEX standard screwed axial bellows are manufactured from either 304 or 321 stainless steel, inclusive of the internal sleeve. Tube ends in either stainless or carbon steel threaded taper male to BS21. Size range 15mm to 50mm with axial movements from 25mm to 50mm. Working pressure of a standard unit of 10.5 bar (150 psi) with temperatures up to 300 degrees C. Units can be supplied with external protection sleeves if required. They can be used on LPHW, MPHW, HPHW, SECONDARY & PRIMARY DHWS. SUPAFLEX standard flanged axial bellows are manufactured from wither 304 or 321 stainless steel, inclusive of the internal sleeve. Flanged ends in carbon steel to BS4505 NP 10-16 are standard, other flange standards can be supplied. FLanges will either be fixed or of the swivel (vanstone or lap) type. Size range 65mm to 300mm with axial movements from 50mm to 70mm. Working pressure of a standard unit is 10.5 bar (150 psi) with temperature up to 300 degrees C. Units can be provided with external protection sleeves if required. They can be used on LPHW, MPHW, SECONDARY & PRIMARY DHWS, STEAM , CCW and CHW where very long runs become subject to contradiction. For CHW application the units must be pre-compressed on installation. Higher pressure and movements can be supplied. Also units can be supplied without internal sleeves for diesel exhaust application and in other materials other than those stated. SUPAFLEX copper axial bellows with plain copper pipe ends to BS2871 part 1 table X, for use on perimeter heating (continuous natural convector), radiator schemes, radiant panel and small secondary DHWS. Size range, all sizes from 15mm to 67mm all with 25mm axial movement. They can be used on working pressures to 6.9 bar (100 psi) at temperatures to 150 degrees C. The units are produced with a stainless steel element and you must make sure to clean off all residual ammonium and sodium chloride based fluxes. Manufactured in single and multi-ply stainless steel. Suitable for low pressure applications to take up both lateral and axial movement, misalignment and vibration. Specially suitable for exhaust systems, turbochargers etc. Available with B.S.P., A.S.A. and D.I.N. 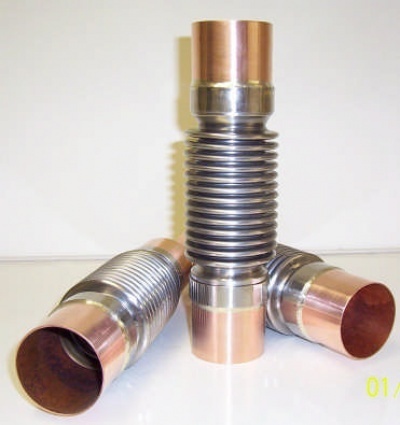 terminations both in flanged and weld end assemblies. Contains two stainless steel bellows joined by a common connecting pipe . Functions by angulating each bellows in opposite directions to give lateral movement in one plane only. Hinged tie bars absorb thrust from the pressure loads resulting in low anchor forces. The amount of lateral deflection is proportional to the distance between the bellows centres. 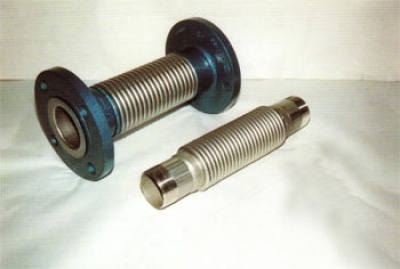 Contains two stainless steel bellows joined by a common connecting pipe and incorporating two or more restraining rods having spherical bearings at their terminations. For the purpose of absorbing two basic movements i.e. angulation and universal lateral deflection or a combination of both. Pressure end loads are contained by the tie rods. Designed to allow angular rotation in one plane only by use of a pair of pins in hinge plates attached to the expansion joint ends. Always used in sets of two or three and can absorb large amounts of expansion. Pressure end loads are contained by the hinge assemblies. Designed as a single bellow contained within a universally jointed framework designed to resist the thrust from the bellows due to internal pressure. Allows angular rotation in any plane, normally used in sets of two or three or in conjunction with a hinged unit.